Gold is a symbol of prosperity for those who wear it. But for those who transform the metal into a work of art, it is a symbol of pride. 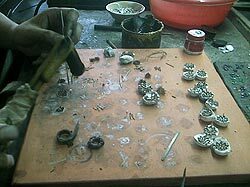 Jewelry-making is not a large industry in Cambodia, yet people who own Khmer adornments love them. 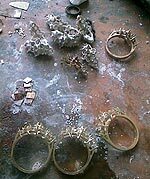 One jewelry maker, Hort Sengkhim, is famous for her gold designs. 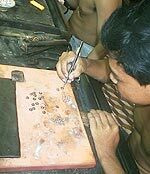 A group of ten Khmer goldsmiths, directed by Hort Sengkhim, prepares jewelry to cater to the likes and needs of special clients with stalls in Phsar Thmei and Phsar Olympic. Some clients reach as far as the United States of America, Malaysia, Indonesia, Burma, Laos, Thailand and Vietnam. Beginning her career in 1988, Hort Sengkhim and her husband have developed a thriving industry making commission off their creativity. Hort Sengkhim has been praised not only in Southeast Asia but all over the world. Once orders for rings and earrings are placed with Hort Sengkhim, the team of talented goldsmiths skillfully turns bland pieces of gold into valuable jewelry. These magicians can transform as much as five to six kilograms of gold into jewelry every month. The length of production varies according to the size and shape of the piece of jewelry commissioned. Accord-ing to Hort Sengkhim, it takes about five days to pound out a heavy piece of jewelry. When selling to large jewelry stores, Hort Sengkhim earns a commission of $30 per gram of gold. She earns just $10 per gram of gold at smaller shops. "Producing jewelry is hard because we need to polish the gem carefully by ourselves," explained Mao Meng-sreang, one of Hort Sengkhim's students. He added that producing a quality piece takes deep concentration and a clear understanding of what the client is looking for. Mao Mengsreang said it is difficult to determine a customer's taste. "We need to understand what the clients like. Sometimes we think a particular model is good, but customers disagree," he said. To work their magic, goldsmiths re-quire certain tools to facilitate their alchemy. A table, chair, pump, gasoline tank, small hammer, saw and file all are crucial components to get the job done. The artisans pour gold into a tank where it is heated until malleable. The softened metal is pounded until it reaches the appropriate thickness, often determined by a client's special order. The met-al is shaped into a ring or necklace and boiled for two minutes until clean. A gem then is placed on a the ring as the crowning touch. Hort Sengkhim said she imports some types of gold from the United States, since there is not enough Cambodian gold to fill her orders. Three types of gold may be found in Cambodia:. Meas kilo is the highest quality gold found in the country, while meas deign and meas kao brahm are 9 percent and 95 percent gold respectively. Working at her workshop at 51AEO Sangkat Phsar Depo II in the Khan Toul Kok district of Phnom Penh, from 7am until 11pm, Hort Sengkhim earns enough to pay her workers $5 a day. In previous years, goldsmiths could earn as much as $10 dollars a day, she said. She explained that between 1988 and 1998 the demand for gold was much greater in the international market. "Even though my job earns me a low income, I still do it to support my family," Mao Mengsreang said. "This little money is enough for my family. I can survive from day to day, but no money is left." A Khmer goldsmith likely will not become rich from his or her job, but the hard work and dedication of Hort Sengkhim and her team prove that the pride derived from good craftsmanship is invaluable.